Eventually, we may feel overwhelmed by anxiety or depression, as if we were drowning; may feel trapped by our past, despite our best efforts; may feel wrongly that ending our lives is the only way out. The prophet, Jonah felt something of this. He had been directed by God to preach to the people of Ninevah, known for their ferocity. In an attempt to avoid what seemed certain death, Jonah booked passage on a ship headed in the opposite direction. He did not get far. To calm a storm which threatened the ship, Jonah asked to be thrown overboard, and was swallowed whole by what the Bible calls “a great fish”. We all know the story. Jonah prayed for deliverance, agreed to carry out God’s command, and three days later was deposited – alive – on Ninevah’s shore. His mission to the city proved successful. These days, people dispute the details of the story. The lesson, however, is clear. Jonah’s task was as much about his own faith, as it was about the spiritual welfare of Ninevah. “ ‘I called out to the Lord, out of my affliction, And He answered me; Out of the belly of Sheol I cried, and You heard my voice. For You cast me into the deep, Into the heart of the seas, And the floods surrounded me; All Your waves and Your billows passed over me…Yet You have brought up my life from the pit, O Lord my God’ ” (Jonah 2: 2-3, 6). With God’s help, we can survive abuse. He walks with us through the darkest nights and the stormiest seas. God can find us, even if we have been swallowed whole. 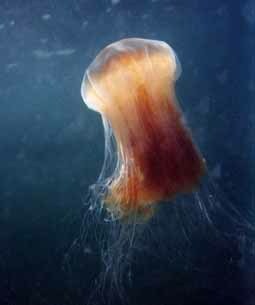 Jellyfish, by the way, are susceptible to a variety of predators. These include marine birds like gulls, large fish like sharks, swordfish, and tunas, sea turtles, and other species of jellyfish. Medical attention is highly recommended. But a sting can be treated with vinegar in a pinch. Thank you Anna for this message of hope for victims of child abuse. Thank you for the positive feedback, Lynette. I’ve never related sexual abuse to a jelly fish sting but more like being swallowed by Jaws and the pieces spit out. Good analogy Anna. Reblogging so as to spread the word. Thank you for your encouragement, Sue. God bless you, in your own work to spread the Gospel. LOVE this so much–thank you, always, for speaking to the legitimacy of invisible scars of abuse. The pain is everything you describe, lifelong for many, and crippling… I just want out–that is my continual cry to God as I beg Him to “make it go away”. It is exhausting to deal with daily. God bless you. An Excellent example, and very good writing, my Dear Anna! The simile of the Jelly Fish is Really Very Good. We may feel overwhelmed by anxiety or depression; …may feel wrongly that ending our lives is the only way out. Jonah’s task was as much about his own faith, as it was about the spiritual welfare of Ninevah. An Excellent example! The simile of the Jelly Fish is Really Very Good.